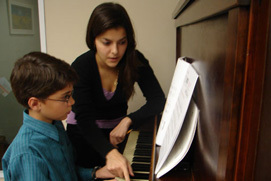 Located across the Greater Brockville Area and surroundings, the Canada Music Academy offers innovative programs for Piano, Guitar, Voice, Violin, Drums and so much more. At our studios or at your home, our outstanding, professional faculty can guide you through Royal Conservatory of Music exams, help you brush up on musical skills, or introduce you to a new musical instrument for the very first time. With creativity and innovation we feel privileged to have inspired thousands of students of all ages across Canada with their musical aspirations. Contact us to register, or visit Teachers & Rates to find a Certified Teacher in Brockville and register online.